Ice on power lines – and even wind alone – can be dangerous and destructive to power lines, leading to a disruption in service. Here we break down the stress ice places on power lines and infrastructure and describe a phenomenon, “galloping,” that sends power lines sailing in a dangerous way. 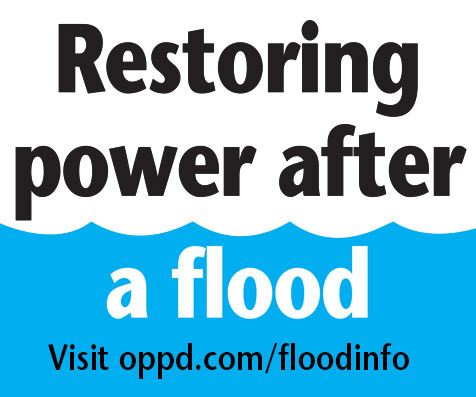 OPPD uses guidelines in the National Electrical Safety Code (NESC) and various weather condition scenarios to determine design criteria for ice load on overhead power lines. 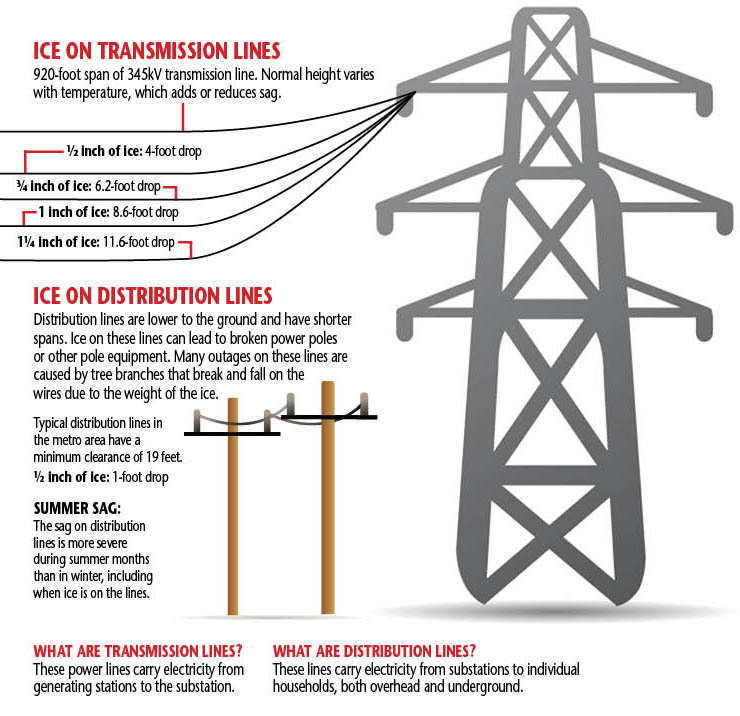 Distribution lines are designed to handle up to 1/2 inch of ice and 40-mph winds. New OPPD transmission lines are designed to handle 1 1/4 inches of ice with no wind, or winds up to 90 mph (a weak EF1 tornado) with no ice. 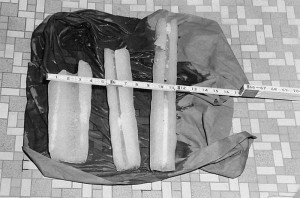 This archive photo shows three cylinders of ice that fell from a power line after a storm, demonstrating the density that ice buildup can reach. 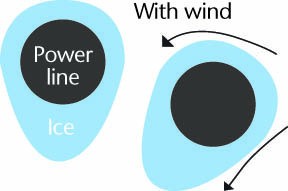 As ice accumulates on power lines, it forms a teardrop shape. Galloping can cause wires to eventually touch, resulting in a fault or subsequent outage. The increased movement can also cause cross-arms to break, bringing lines to the ground. To reduce galloping and its dangers, you may see twisted wire or metal pieces attached to certain lines. This video will show you more. Our power line to the house has a heavy coat of ice, about an inch thick, which is pulling down the line. As the wind picks up, I am concerned that this extra weight could pull down the line and cause an outage. 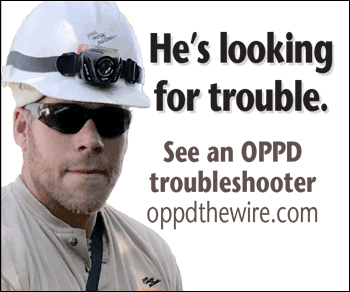 Is it safe to try and knock the ice off the wire? Is this something I should report to OPPD and let them take care of it? Or do I just wait until the line breaks and the power finally goes out? Mary Kay: DO NOT approach the line or attempt to clear the ice and snow in any way. 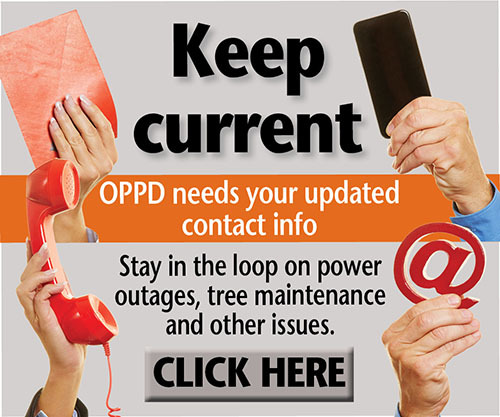 If you lose power, contact OPPD.